The Stone Town of Zanzibar is a well-preserved example of a Swahili coastal trading center. Stone Town is the old part of Zanzibar City, built on a triangular peninsula of land on the western coast of the island. Its Swahili architecture incorporates elements of Arab, Persian, Indian, European and African styles. The Arab houses are particularly noticeable because they have large and ornately carved wooden doors and other unusual features such as enclosed wooden verandas. The site has probably been occupied for around three centuries with buildings only being constructed with stone since the 1830s. The town was the centre of trade on the East African coast between Asia and Africa before the colonization of the mainland in the late 1800s after which the focus moved to Mombasa and Dar es Salaam. The main export was spices and particularly cloves. For many years Stone Town was a major centre for the slave trade; Slaves were obtained from mainland Africa and traded with the Middle East. The Anglican Cathedral is built on the site of a former slave market. Some of the holding cells still exist at the site. I really enjoyed Stone Town. Probably because it's so different from mainland Tanzania: it has historic buildings, museums, bustling city life. This all is the result of the very different route in history Zanzibar has taken from its partner Tanganyika, with which it has formed the United Republic of Tanzania since 1964. Its attraction lies in the car-free narrow streets which show the Arabic and Asian influences and did remind me of Kathmandu or Jerusalem. I made three separate visits to Stone Town, which is almost hassle-free to walk around on your own, exploring more and more of the backstreets on every visit. The bigger late 19th century monuments are located at the main street looking out over the sea. It starts up north with the Old Dispensary, a turquoise coloured ornate building that looks very Indian. The Palace Museum is located in the former palace and shows the life of the Omani sultans that ruled Zanzibar from 1698 until independence. Its interior decoration is a mix of European and Indian styles. Next to it stands the House of Wonders, now a museum of Zanzibar history. The Old Fort is like an old fort everywhere - they do survive quite well due to their sturdy construction, but this isn't more than a set of walls. 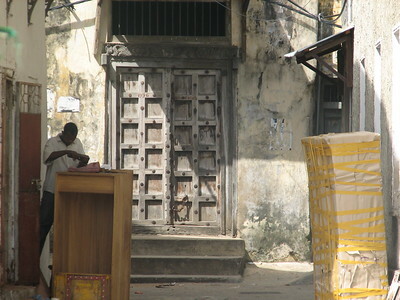 A lot of the historic monuments in Stone Town are very run-down anyway. The house of notorious slavetrader Tippu Tip even looks to be taken over by a family of squatters. On the bright side you can see everywhere the wooden carved doors that are the city's trademark. They often are in better condition than the buildings that they form the entrance to. In the central part of town the two churches / cathedrals can be found: Roman-Catholic and Anglican. Both look very foreign in this surroundings. The latter also houses the Slave Monument and the low and cramped dungeons where slaves were kept before being sold at the local slave market. I first heard of Mr. Mitu's spice tours from a Scottish lady in Arusha, Tanzania. My friends and I had just finished a safari and she was trying to put together one, and we were comparing notes. She said that there were three musts when I got to Zanzibar—hang out at the beach, go to nearby Prison Island and see the giant tortoises, and take the spice tour. I was intrigued. So the next morning. I bought a bus ticked for Dar-Es-salaam, the capitol of Tanzania, where it was said transportation there could be had. One thing that must be said about Tanzania: it's dead broke. It's been that way since the war with Uganda in 1979, and consequently hasn't been able to start repaving the roads until very recently. this makes it very hard to sleep on the overnight bus, a situation aggravated by the driver's playing a tape of "Mammu on the Telephone" at full blast over and over again for most of the night. Arriving at Dar, as it is called, one becomes aware of another consequence of Tanzania's being broke—they won't take their own money for all but the bottom-line accommodation and travel, U.S.. dollars and pounds sterling only. So having a hundred dollars in Tanzanian shillings (14,525 in 100 shilling notes), I had to spend the better part of the morning looking for a place that would take them. Fortunately the YMCA had a bed at my second try there. I was ready to find transportation to Zanzibar. Zanzibar is an island about sixty miles northeast of Dar, and there are three basic ways get there, only one of which takes shillings; airplane, hydrofoil, and dhow. Dhows take shillings. They leave at midnight and take about six hours to make the journey, which is very much like being on one of those slave ships of yore, as a slave. You also risk getting sick, or someone getting sick all over you and getting your luggage stolen. The airplane,which takes credit cards, is usually booked up two weeks or more in advance, and even if they aren't, they'll say they are anyway. This leaves the hydrofoil. The hydrofoil is called the Virgin Butterfly. Why it was named after the infamous sexual position on L.A. Law is a mystery I couldn't solve. It could be the other way around, or just a coincidence, since nobody in the organization claimed to have heard of the TV show. Alone among dollars-only institutions on the Tanzanian mainland, The Butterfly also gives change in dollars. This is a lifesaver, because even bottom-level zanzibarbarian hotels refuse to take shillings. It's comfortable, takes an hour and a half to get there and shows tapes of bad movies. Many people in Zanzibar give spice tours, but by far the best is that given by Mitu. Mitu is a short, dumpy fellow with big ears, a huge nose, and a prodigious knowledge of the botany and history of the island. He can be found early in the morning with his trusty assistant and two taxi cabs in front of the Malindi sports club, waiting for the tourists who are lucky enough to get ahold of him, which is getting to be rather difficult, as he is one of the best tour guides in the world. Every five minutes or so, we stop to check out a fruit or some weird tree... have you ever tasted rubber? No? You're smarter than I thought... We discover the differences between the many species of grapefruit, some of which can get as big as your head. Lemons can get to be the size of normal grapefruits, kumquats the size of tangerines, and tangerines, um, well, they're the size they ought to be. Mitu has an amazing effect on children. Everywhere we go hundreds of children come from nowhere and call out his name. We stop for them too, and we discover that it isn't just because of his good looks, he feeds them with the fruits he picks up. They crowd around him while he slices up a soursop, which is a large thin melon-squash like thing, and call out his name. He loves this, I can tell, for there's a big smile on his face. "Over here's coffee, The Kenyans will tell you that theirs is the best in the world, but don't believe them, ours is much better, taste! Over there's a cocoa tree. The beans are very bitter, but taste the flesh, it's like nothing you've ever experienced before." On and on we go getting royally stuffed in the process. We stop at what was the residence of a nineteenth century sultan's favorite wife, the daughter of the Shah of Iran. He bids us to climb the structure, and points to the sea. "From here you can see Kilimanjaro. We are higher than it, because we're on an island. The sea is five miles deep and Kilamanjaro is only two miles high. We are above the sea, while Kilemanjaro is only above the land. "The claim is dubious at best, but I swear I saw something out there, and it very well could have been Kilimanjaro. After about ten minutes of squinting, we sat down to a feast of lemon and bananas. Why he chose to ruin perfectly good bananas with lemon juice, I cannot say, maybe to clear out pallets of the joys to come. Leechees look like almost nothing else. The outer shell is hard and spiky, and the inside is gelatinous mass covering a hard nut. The nut doesn't taste all that good but the gelatin is music to the tongue. Something like a cross between a pear and an apple. It brings new meaning to the word yummy. But leachees are as sawdust when compared to chicklets. The chicklet does not look like little candy covered square, but is almost a dead ringer of the peach. But it is here that the resemblance ends, for the taste is like nothing else in the world. The closest thing that you can get is sugar cake. "You can spend the rest of your life doing nothing but eating these." Mitu says. I agree. We stop at a roadside tea shop and drink local coffee. While we do this Mohammed takes out all the fruit we've been collecting and puts it on top of the trunk of the car so it could be photographed. You cannot see the trunk at all. It's amazing. The last stop before returning to the Malindi sports club is the beach. Zanzibar has secluded beaches that can match just about anywhere. Unfortunately, nobody had told me about this, otherwise I'd have brought my bathing suit. But what a view! Stone Town is the last of the 4 WHS reviews from our Feb 2008 “Indian Ocean” trip (despite being the first site we saw), mainly because I have had difficulty in deciding what to say about it - I wonder why? There was nothing wrong with the place and I have no really negative comments. The general atmosphere is relaxed and reasonably “safe” and there are points of interest – but nothing greatly memorable. So I cannot really “enthuse”. Interestingly at the 1982 WHC Zanzibar Stone Town was rejected (not just “deferred”) with the simple (and very “final”!) phrase “Should not be considered further for inclusion”. Yet at the 2000 WMC it reappeared “from the dead”, with not so much as a “deferral” in the previous year for strengthening of Management Plans or similar! Strange are the ways of the WMC – I wonder what had happened at Stone Town in the intervening 18 years to change it from a “no hoper” into “3 criteria” success! The place is certainly “on the up”, with old buildings being developed as “boutique hotels” (though many also remain in disrepair) and a beautiful Serena hotel on the waterfront. Thankfully these developments have avoided obvious intrusiveness since the town’s original “completeness” was stated to be a particularly significant factor in its UNESCO inscription. Apart from the Portuguese fort, the vast majority of buildings, and all the significant ones, date from the nineteenth century and create an atmosphere drawing significantly on India and Arabia. The inscription mentions that 32% of buildings are derived from Indian models and 25% from Arab. At times I had to remind myself that this was Africa - I personally kept recollecting a visit to Fort Cochin. In addition to the narrow balconied streets (often described as a “maze” but in reality not covering that large an area and never far from the sea), and the standard “eastern” markets and spice vendors etc (Zanzibar “majors” on spice! ), there are also a number of buildings to see of varying interest and quality which receive specific mention in the Evaluation. First the Anglican Cathedral - built on the old slave market to commemorate the ending of the Arab dominated slave trade. I personally didn’t find its “Islamo-Gothic” style very attractive but the linkages to Livingstone were interesting and the brass plates commemorating the (often short) lives and deaths of British expats shouldering what they saw as “the white man’s burden” have a poignancy – not all “colonialists” lacked compassion or ideals. Speaking of which – the nearby slave house with its grizzly dungeons failed totally to put Zanzibar’s particular example of the slave trade into its historic African, Arab and Islamic (and not, in this case, a significantly European) cultural context. In Zanzibar, slavery over the centuries was very much a horror meted out by Africans and Arabs on Africans and its cessation was very much a European inspired action. See Wikipedia “Islam and Slavery” and its related links to the Arab Slave Trade etc if you wish, at least, to balance the “politically correct” Eurocentric impression of African slavery which dominates today in Western guilt complexes and African accusatory politics! I had been particularly anticipating Tippu Tip’s traditional Arab town house but it is very dilapidated and not open to visitors. It has its carved door (a “speciality” of Zanzibar) but the historical spirit of this slaver, ivory trader and empire builder, the “uncrowned king of the Arabs in Central Africa”, who vied with Leopold for control of the Congo and ultimately threw in his lot with Stanley, was totally missing. Conversely, the House of Wonders (photo) and Palace Museum, did bring to life the trajectory of Zanzibar’s Omani dynasty from 1840, when the capital was moved from Muscat, through the nineteenth century when they created an empire in Central Africa and on to the early twentieth century when they ruled under British “protection”. The House of Wonders was built in 1883 at the apogee of the ruling family’s power and is an impressive structure (photo) with some good exhibits (including one about the Sultan’s daughter, Princess Salme, who eloped to Germany and converted to Christianity thus epitomising the disruptive nature of the European presence). From there it was all downhill and, in the Palace Museum, you can see the rooms, with mundane 1950’s suburban furnishings, where the final Sultan spent his last days as “Ruler”. Much to the disappointment of the locals we had NO interest whatsoever in their “trump card” for the “most interesting place” in Stonetown i.e. the Birthplace of Freddie Mercury (nor does it get a mention in the UNSECO inscription!). So - perhaps writing this review has led me to find more of interest in Stone Town than I felt at the time! I can fully understand why it draws people in. At one end of the market it is a good place for back-packers to break off from the rigours of trans-African travel and get a bit of R+R in a pleasant “multi-cultural” atmosphere with nearby beaches. At the other it offers “safe” exoticism and some upmarket hotels. As a WHS, its historic and architectural “whole” probably justifies its inscription - but don’t expect too much. This ancient town has not lost the magic and allure it used in seducing and enticing kings to abandon their subjects and move their seat of government away from home. It is the only town in which one may wander about freely at midnight without any fear of mugging. With her friendly, cheerful, out-going and welcoming residents, Zanzibar is a relatively safe haven unlike many cities of the world where I am often cautioned against even venturing beyond the hotel precincts unaccompanied by armed security. Zanzibar Island, I am told, was colonised over the centuries by a succession of people ranging from Egyptians, Chinese, Persians, and Omanis, to Portuguese, Dutch and British. This legacy has given rise to the cultural hotpot reflected in architecture, culture, religion and cuisine of this almost magical East African island whose every corner offers a new, exotic scent. Heavy wooden doors and their frames carved as intricately as the embroidered caps on the heads of older men give a magical feel to the maze of narrow alleyways that reminds one of the ancient Middle Eastern towns as described in the Bible. Add to it the curry and cardamom from the kitchens and sandalwood from the almost enchanting women in black robes and what you have is a magical, fairy tale-like Spice Island. "Should not be considered further for inclusion"
Baths: There are two sets of Persian baths in the Stone Town. The most elaborate are the Hamamni baths, built during the Sultanate of Seyyid Barghash (1870-88). Fusion: "brought together and homogenized disparate elements of the cultures of Africa, the Arab region, India, and Europe"
Henry Morton Stanley: Equipped and commenced his expedition to find Livingstone - Mar 1871. Queen Victoria: The Old Dispensary was built "to commemorate the Golden Jubilee of the British Queen Victoria in 1887"
Poetic Quotations: "It is not worthwhile to go around the world to count the cats in Zanzibar". Henry David Thoreau in the Conclusion of "Walden" 1854.